It all started with a beer at the University of Wisconsin Memorial Union Terrace. It was 2008, and ultra-distance athlete Darren Fortney was kicking back with friends at the Union. In case you’ve not frequented the Dairyland State, the Union Terrace is a Madison institution in itself. Decades ago the university decided, in a stroke of genius, to have an outdoor pub along the shore of Lake Mendota. Consequently, generations of students and Madison residents have gathered there to hear music concerts, raise a glass, and linger over sunset views of the lake. Fortney’s lakeward gaze wasn't idle admiration, though. Since taking up running in 2004 to help recover from a botched back surgery, he had found endurance sports to be addictive. After conquering several half-marathons, marathons, and triathlons, Fortney began adding ultra-distance events to his schedule. Fifty-mile running races led to 100 mile events - and he kept finding new opportunities to push the limits. So to him, Mendota wasn’t just a pretty lake. It was a challenge begging to be met. "I bet I can swim that," he told friends. Never mind that not long before, he was deathly afraid of water. Fortney's inspiration to swim began in 2005, when he watched Ironman Wisconsin swimmers tackling the open water from his kayak as a race safety volunteer. "I could not swim," he recalled, only tacitly acknowledging the irony. "My biggest fear is drowning." Deciding to face his fears head-on, he joined a master's swim class and not only learned to swim, but honed his technique enough to compete in the 2006 Ironman Wisconsin race. He finished the 2.4-mile swim portion in a respectable 1 hour 18 minutes and 18 seconds. To spend any time in Fortney's presence is to realize he has a straightforward approach to life. Overcoming personal trials ranging from cancer to spinal cord injury has re-framed his perspective. He is one of those individuals who simply asks "Why not?" when approaching a challenge - and the bigger the effort, the better. He also routinely mentors fellow athletes, and through charitable fundraising, seeks to help those facing serious medical issues, particularly cancer. He raised over $21,000 for the University of Wisconsin Comprehensive Cancer Center in 2006, and over $4,000 for cancer resource center Gilda's Club Madison in 2009. "I am just one of the lucky ones able to give back," he said. "Lots to be thankful for." So it didn't come as a surprise when Fortney quickly brought his ultra-swim idea to life. The first year, there were seven swimmers - mostly friends from his master's swimming class. In 2009, the group swelled to 10 swimmers, and Fortney did the swim the day after a 25-mile training run. By early 2010, Fortney found himself planning the 3rd Annual Lake Mendota Crossing. Though the event still remained “rogue”, in his description, "We’ve got 13 swimmers, 13 kayakers, T-shirts, and we had a a logo made." This is not to say that the swim had gotten any easier over the years. To put things in perspective, the course is nearly three times the length of the swim portion of Ironman-distance triathlons. And the effort involved in open water swimming is incomparable to doing laps in a swimming pool. In the first two years, swimmers had experienced high winds that blew them off course, algal blooms, and a sewage leak. Two of the kayakers who help keep the perimeter safe for the swimmers, Marcia Hartwig and Susan Jones, work on the Take a Stake in the Lakes program for Dane County. At one point, the group sought media coverage to raise awareness of water quality. The potential for problems and even dangerous situations was very real. Fortney and the rest of the organizers were careful to do everything they could to keep things safe, including requiring wetsuits, ensuring CPR-trained personnel were available, using a buddy system with color-coded swim caps, and hiring a pontoon boat to accompany them. Only highly experienced swimmers were invited to join. But life sometimes throws in challenges that simply can't be anticipated. For example, injury. Prior to the 2010 crossing, veteran swimmer Ken Wood wrote, "Having done this swim the past two years, coming into it there weren't too many challenges left until a 3rd degree shoulder separation in March completely derailed my swim training and fitness for completing this event." Unable to train for distances longer than two miles while he recuperated, Wood worried about his preparation. Then, in the week before the swim, Fortney fractured a rib during a camping trip. In a message to swimmers, he wrote, "Not sure if I will be able to make it but I will surely give it my all. Kind of funny how one little rib can send you to your knees in pain." But as many physical discomforts as the swimmers and kayakers faced, Fortney and others knew in their hearts that this was inconsequential compared to the daily trials of cancer patients. So along with arranging all the logistics for the swim, Fortney decided to launch a fundraiser in conjuction with the swim to benefit Gilda's Club Madison. Having worked on charity benefits for Gilda’s Club before, he knew that the programs and resources they offer for cancer patients and families were worthwhile and effective. With writing and publicity support from Focal Flame Photography writer Robyn Perrin, he worked with Gilda's Club staff members Sara Goetz, Marketing and Events Coordinator, and Gail Nichols, Executive Director, to quickly put together an online donation site dubbed “Gills for Gilda's”. The site went live on June 9, 2010. Initially, Fortney thought a few hundred dollars might be raised. But aided by the power of social networking, something amazing happened: thirteen swimmers and thirteen kayakers told all their friends and family, who told all of their friends and family...and 16 days later, by the date of the 3rd Annual Lake Mendota Crossing, 129 donors had contributed over $5,000 to Gilda’s Club. Goetz and Nichols were astounded and grateful beyond measure. "$5,000 helps us fund one of our weekly support groups for an entire year," said Nichols. "Our support groups are there for men, women, teens and children who are affected by cancer...The Lake Crossing swimmers, like our [cancer patient and family] members, showed that they stick together, they watch out for each other, they learn from each other, and support one another. This is the essence of the mission of Gilda's Club." Fueled by the success of their fundraising effort, Gills for Gilda's members headed into the Lake Crossing on June 25 with beautiful weather conditions. Clear skies and air temperatures in the low 80 degrees F led to smiles all around as swimmers donned wetsuits. But once underway, choppy waters led many of the athletes to summon all their fortitude to continue. Sue Ellen Ostrom wrote, "This year the challenge was the waves. It wasn't physically challenging, but rather mentally. At first the waves were fun, but then they just kept coming....It became important to focus on making forward progress instead of letting my mind wander to the negative thoughts of feeling pounded by wave after wave after wave." The group also battled thick patches of underwater weeds. "Came kinda close to a panic attack, there," admitted Amy Rogers. As the afternoon wore on, fatigue set in. "I remember being very strong and motivated and it being fun for the first 2 hours," wrote Petra Kilian-Gehring. "Then, the wheels started coming off and the last hour and a half I remember really struggling and losing strength, speed and motivation and the shore kept looking far far away and I felt like I didn't want to do it anymore but I NEVER thought about quitting once!" Gary Gruenisen remarked on the isolation of being in open water, describing the sensation as "Such a large place and feeling so small." Three-year veteran Lisa Kirby-Mangas wrote, "Unfortunately, this year I got sick a few times in the water with less than 30 minutes left to shore. This was memorable to me because my goal in starting the swim all three years has been to finish. It was a hard decision for me to get out of the water and get on the pontoon boat." Kirby-Mangas continued, "In the days post-event, I have been thinking about those feelings and how they relate to other events in life. Many times I have to adjust my sails (or goals) based upon life's events. In this swim, I still had success swimming a long distance even though unforeseen events required that I arrive at the shore in a pontoon boat. I have thought of Gilda's Club, and how many other people have to change the path of their lives based upon life circumstances that are out of their control. Getting on the boat instead of swimming was such a small detour in a small goal." In the end, all thirteen swimmers made it safely to shore and - fittingly - spent the remainder of the afternoon jubilantly celebrating at the Union Terrace. Many expressed simple gratitude. 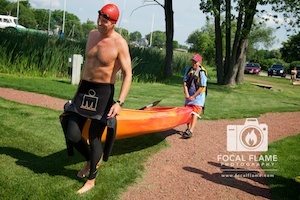 After the event, Ken Wood wrote, "We are truly blessed to be have mostly fully functioning bodies that allow us the honor and privilege of swimming, kayaking and enjoying the great outdoors. We are fortunate that our endeavors have inspired others to contribute to a worthwhile organization that helps people in need. What you give to others usually comes back at you tenfold." Bonnie Busch shared, "That fact that we may never know who is aided, inspired, comforted or helped [at Gilda's Club] by our own simple acts doesn’t mean that someone isn’t. Nothing is impossible." And the sweetest part for Fortney? Seeing his son Ryan's face at the finish. For the first time, Ryan Fortney participated as a kayaker. His tenth birthday fell on the day before the lake crossing, and he put his entire decade's worth of determination into his arms, paddling hard all day long. When asked what he wanted his dad to know about the Lake Mendota Crossing, Ryan was quick to answer, "It's really cool and he should keep doing it. Lots of friends are joining in. They must like it too." The irrepressible grin on the younger Fortney's face summed up in a glance what the Lake Crossing is all about: Hope. Renewal. Future. Taking on a challenge, like swimming across a lake - just because it’s there. Just because you’re among friends. Just because it's inspiring. Check out more images in the 3rd Annual Lake Mendota Crossing Gallery. To follow these and other stories, join the Focal Flame Photography Facebook page and follow our Twitter feed.